Buddha Maya Garden Hotel and Resort is managed by the famous Kathmandu Guest House, the Asia's leading budget hotel with 35 years of experience in travel trade industry in Nepal. Located in a calm and serene area of Lumbini World Heritage garden peripherial and yet so close to the sanctum of the sacred pilgrimage, you can feel the spirit. You may wake up to the sound of chirping of birds and religious hymns and take a morning walk to Sacred Garden, mediate in ancient archeological ruin or in front of Ashoka Pilar in totally pollution free environment. In day time, you can visit to Manastic Zone to see the facinating archeological ruins, and magnificent monsteries and monuments. Buddha Maya Gardens is a 3 star up-market category hotel owned, run and managed by the KGH group of Hotels and Resorts. It is set in 4 acres of wooded land. A 10 minutes walk away from the Mayadevi temple, the birthplace of the Lord Buddha. Maya Gardens stands impressive with its vernacular architecture in terra-cota finishing. The hotel garden is extensively planted with indigenous trees that were found in Buddha Era. 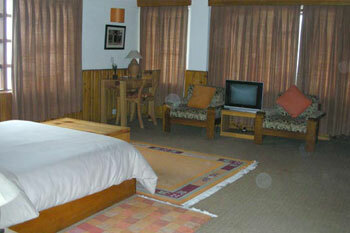 All rooms are air conditioned with attached bath, TV, EPABX Phone and balcony. Other facilities includes, wide balcony overlooking magnificent sunset and the sacred garden; impressive high-ceiling Atrium Hall way and lobby, "Nirvana" Conference Hall (60pax), Buddhist Library, Meditation Hall, Prayers room, Business center, Parking areas; Travel Counter, Mountain Bikes hire, private cars to organize sight seeing tours in surrounding historic sites. Located at a distance of about 27 kilometers west of Lumbini lies the ruins of the historic town of Kapilavastu. Believed to be the capital of Sakya republic where the Lord Buddha lived and enjoyed his life until his 29th year ancient Kapilavastu has been identified with Tilaurakot by the archaeologists. I here are ruins and mounds of old stupas and monasteries made of kiln-burnt bricks and clay mortar. The remains are surrounded by a moat and the wall of the city is made of bricks. In fact, the sight of the city of Kapilavastu visualizes a seat of high culture. Arorakot At about nine kilometers north-east of Taulihawa there is a large rectangular fortified area which is popularly known as Arorakot The fortified area is identified by the famous Indian archaeologist P C Mukherji as the natal town of Kanakmuni Buddha. Remains of the ancient moat and brick fortification around the Kot can still be clearly seen. A brick line is seen to the south and an elevated mound towards the north-west corner. At about eight kilometers north-east of Taulihawa there is another site of archaeological importance. The site has a quadrangular pond locally known as Niglisagar and surrounded by bushes. On the western bank of the pond there are two broken pieces of the Ashokan pillar the longer one lying flat and the shorter one stuck into the ground. The pillar bears two peacocks on the top part and a Devanagari Script inscription reading Om Mani Padme Hum Ripu Mallasya Chiran Jayatu 1234. The shorter portion of the pillar which is partly buried in the ground measures 1.52 ms in length and bears four lines of Ashokan inscription in the Brahmi script which roughly translates as: King Piyadasi beloved of the gods after 14 years of his coronation enlarged for the second time the stupa of Buddha Kanaka Muni and after 20 years of his coronation he came himself and worshipped (and) he caused (this) stone pillar to be erected. At about 12 kilometers north of Taulihawa there is a forest area called Sagarhawa. In the midst of the forest there is a huge rectangular pond popularly known as Lumbusagar or a long lake. The ruins of the ancient pond which was excavated and identified by Dr. A. Fuhrer as the site of "massacre of the Sakyas" can still be located on the south-west bank of the sagar. Ramagrama is the maternal home of queen Maya Devi and the country of the Koliyas. A huge ten-meter high brick stupa one of the eight dharu stupas containing the relics of the Buddha stands on the bank of the Jharahi river. Still unopened, it is the landmark of the historic Ramagrama. Legends say it is protected by a Naga. Recent explorations by a British team headed by Dr. Robin Coningham has indicated that there are few more important structural remains around it. This is only a cursory glance at the main historic sites of the Lumbini area. The area has many more archaeological/historical sites partly explored and many other completely unexplored. Therefore as conservation and construction activities continue in the main complexes at Lumbini and Kapilavastu other sites also need proper treatment in order to fully exploit the vast richness of the region and enhance the glory of Lumhini: The Fountain of World Peace. At about five kilometers south-west of Taulihawa there is a village called Gotihawa. In the village there is an Ashokan Pillar standing on a slab. The upper portion of the pillar is lost and only the lower portion about 3.5 ms high is still intact. Adjoining the pillar towards its north-east side, there is a huge stupa with successive rings of wedge-shaped Mauryan bricks. Kudan is located about two kilometers south of Taulihawa close to the Shorargarh -Taulihawa Road. There is a huge mound of structural ruins with a cluster of four buildings and a pond. The mounds excavated U1 1962 indicated that there stood a huge Gupta style temple in ancient times. This complex requires proper archaeological conservation. The rates are in US Dollars. All bills must be settled in convertible foreign currency one day prior to check-out. Credit Cards (VISA, Master Card, American Express) are accepted. Complimentry room to the group leader of 15 paying pax and above. No extra charge for children under 6 years occupying the same room and bed with parents. Maximum of 1 child per room.